I didn’t mean to let two weeks get away from me there, but…nope, can’t blame work, can’t blame the Thanksgiving holiday–I have to blame the library book! That’s okay, I’m always happy when a book is so enjoyable it overtakes my free time. But now back on track. The knitting has been slow lately. We had a sharp cold spell + early heavyish snow (for not being in a lake-effect zone) that reminded me that I need to finish up a scarf/cowl thing I’ve been working on forever. 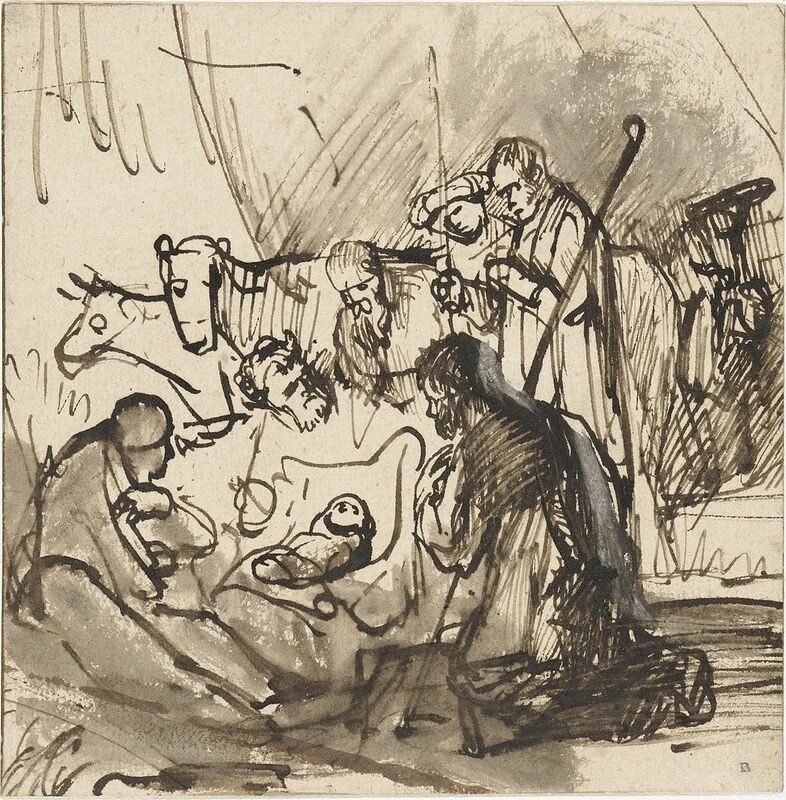 However, that’s all I managed to do with it–remember. I keep poking away at my les Abeilles, but it’s really been the non-knitting that’s calling to me. 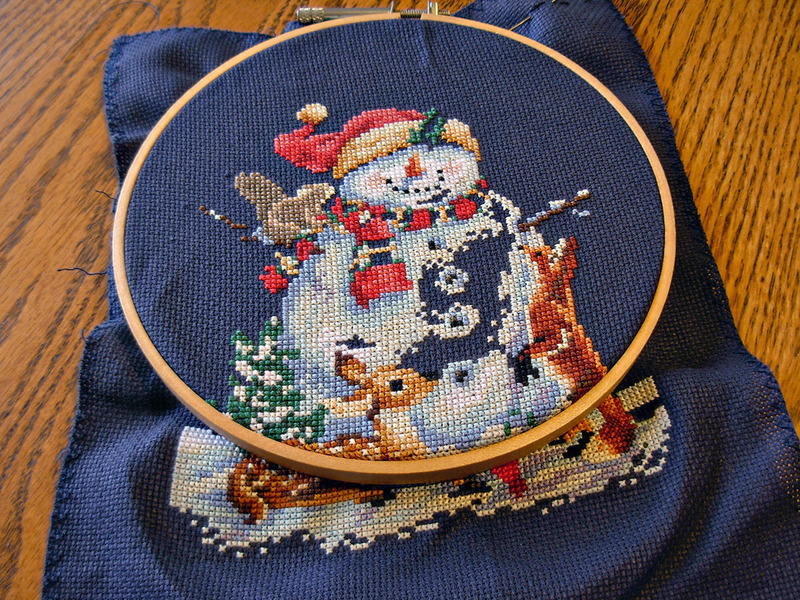 I’ve had this cross-stitch snowman in progress for years. (In fact it was part of my 2013 goals to finish. Fail. Also, the 2013 picture was better.) Finally, I find myself picking it up as my current go-to. So this little snowman’s to blame for the current knitting stall. It’s been the perfect companion for the continuing ed I’ve had to finish up by the end of the year. And for TV watching. I finally feel like I’ve made some real progress and maybe I might actually finish–well not this year, but maybe in 2015. I do need that scarf though. And then there’s the super-fun, super-easy project I did on Friday. 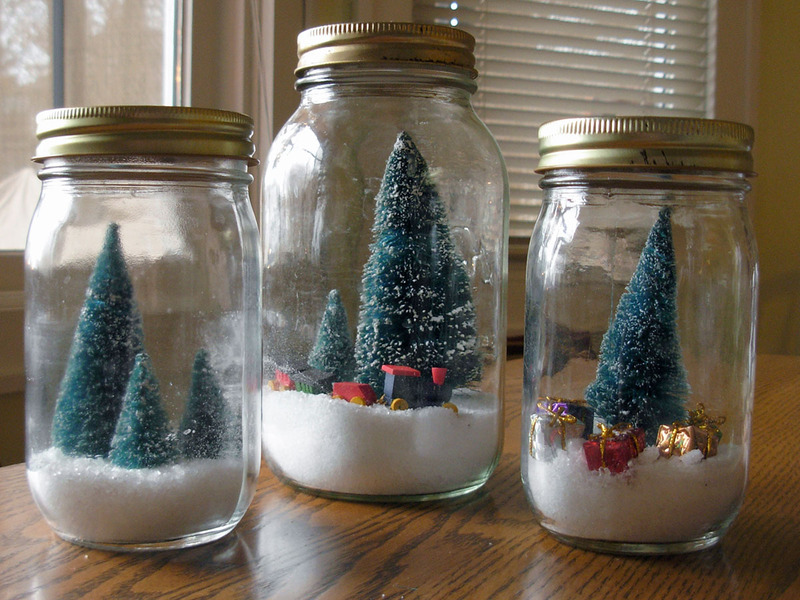 Just some empty jars, add some Epsom salt for snow and some trees and mini gifts from the local craft store. I think I spent more time in line at the store than it took to put them together! The idea isn’t mine; I saw it HERE by way of one of the book blogs I read (pity I didn’t have nice antique jars like hers to use). Now I feel like I just need a Rudolph and the scene’s complete. I don’t usually do much specifically for Christmas, but these were too fun and easy to pass up. And uh-oh, I have one other project for the holidays that I might try to get to. I won’t actually need that scarf soon will I? So. I seem to be in one of those “do things” moods that don’t necessary strike all that often, but that I try to take advantage of whenever they do happen. Especially as they usually seem to result in baked goods at the end. (Bread currently in the oven.) So far, I’ve managed not only to stir up the aforementioned bread (really simple recipie – it’s taken me longer to type this than to stir it up), mix up some hot cocoa mix for the coming weeks, take some autumnal garden photos, and finally, finally catch up on blog reading (which, since I subscribe to way too many book blogs and book bloggers tend to be wordy, can take some time). 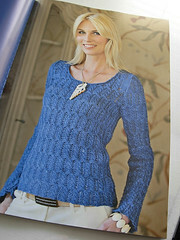 So while I was at it, I might as well finally get back to the knit blog, right? Especially since I’ve actually been knitting lately. Although it’s been a bit busy this fall (work, mostly–there was this crazy two-week period with back-to-back deadlines–never again! ), the pull of the knitting needles has been strong. I finished one project I started in the spring, I’ve passed the half-way point on another, and some non-knitting crafts have been worked on as well. There’s another forthcoming project planned, and isn’t it about time to finally finish the scarf to match my hat? (Maybe if I do that, winter won’t be quite so…wintery…this year.) And I’ve decided that I want to be more faithful not just to the knitting/crafting, but to the blog. Once weekly posts will be just right, I think. There’s a bit of a mini-backlog to talk about just now, which will fill some time, and, fingers crossed, I’ll keep up enough to always have something to share. I actually managed to take some pictures of the latest finished project today, but I think that shall wait until next week. A teaser to get myself to post? I just realized that it’s been a whole week that I’ve had a fully functional computer back yet I hadn’t provided an update! It turned out to be (almost) the best case scenario: easily fixable for not-too-bad a price. I think my jaw actually dropped when they told me how little it was going to cost. Yay for refurbished parts! (And now I cross my fingers that the non-name-brand refurbished part continues to work…) The labor cost was amazingly low—I don’t think the major chain brand would have even looked at it for less than 3 times what I paid for the labor. I was told that the part was pretty easy to replace though; I guess it’s a good thing that I had taken it apart already trying to dry it out and had my dad drill out the stripped screws! This would be the first pie I have ever made, crust and all. I will never make such a good pie again: the crust was so flaky it fell apart just trying to cut it. I have no idea how I’ll ever replicate that! 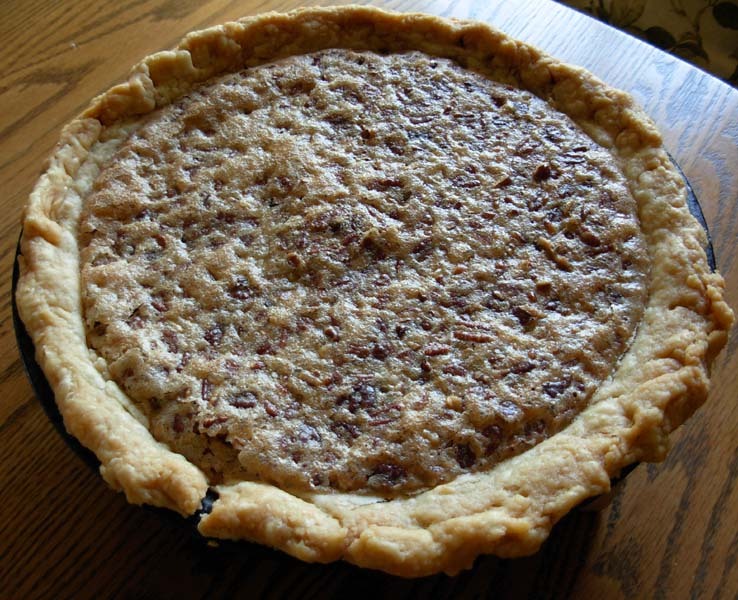 The pie is a Kentucky High-Day, which is basically a pecan pie with chocolate chips added. Super easy filling, super rich, super yummy. As for that knitting? Hopefully by the end of the month. 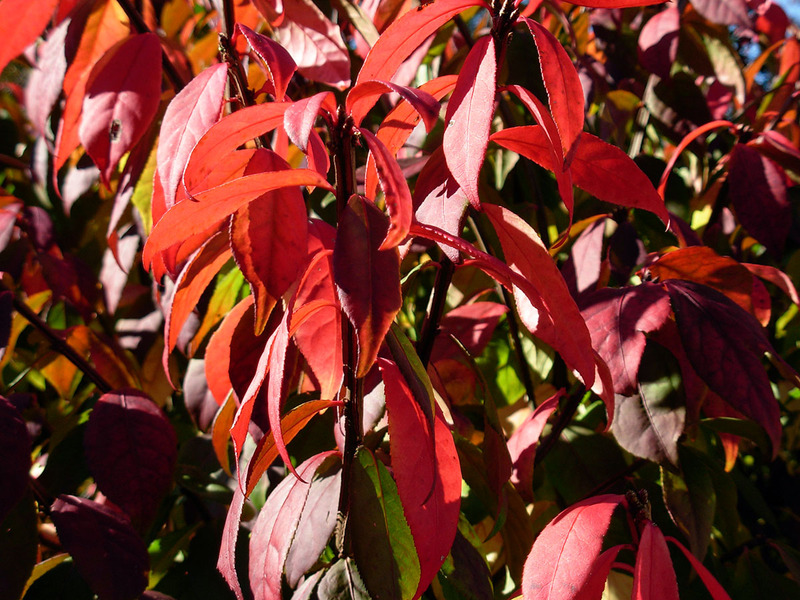 But then I’ll need something new….time to start planning! I didn’t mean to be away for so long, truly I didn’t, but between this distraction and that I haven’t managed to put up a post. Alas. Of course, I haven’t managed to get in very much knitting either. It’s just been one of those months. 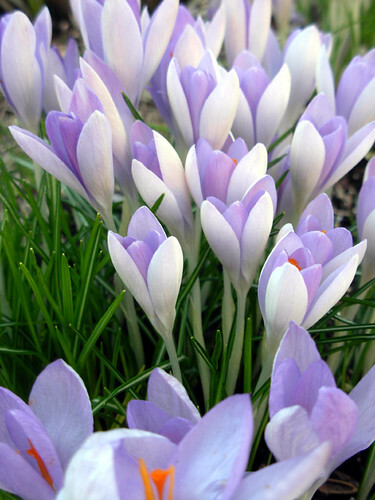 I seem to be finding that April is a month to “get through,” and this year was no exception. I am typing this on my ancient and frustrating backup laptop, while my regular machine is sitting silent and still on a shelf patiently waiting diagnosis. Or rather, verification of the problem. See, Thursday past I accidentally (and very unintentionally) dumped a cup of tea on the table, the floor, myself…and my laptop. Before I could unplug it and remove the battery it shut down, a possible short. Despite my best efforts to dry it out, it still won’t start and so I took it to the repair shop this morning. The interesting part here is that I found the shop by way of a friend of my brother’s—his cousins own/run the shop, and it just so happens that they are Amish. Whatever works. 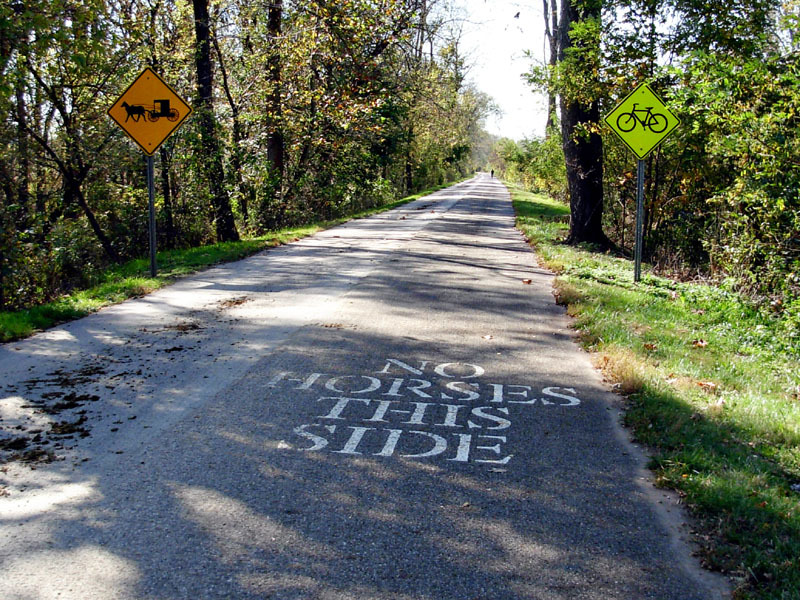 It was a lovely drive down into some of the more rural parts of Ohio, by the way. I can’t believe they thought I wouldn’t want to make the drive—my brother’s friend had kindly offered to take the computer in for me. I’m perhaps more paranoid than most: in the course of 3 computers I’ve owned I’ve had to replace at least two mother boards (third diagnosis pending; previous mother boards were under warranty) and one hard drive. When I was in school several of my classmates had laptops stolen (out of a supposedly locked studio). Tragedy happens. So I backup on a weekly basis. It just so happens backup day is Wednesday, so I only lost a few hours worth of unimportant notes. If I had more important files/created files more frequently I would backup more frequently, and given the suddenness of the tea incident I’m thinking that I should at least consider it now. I also have a new appreciation for “the cloud.” It is somehow very reassuring to open up Spotify and realize all my playlists are there, no matter what computer I’m on. Now that I have my backup computer updated with the files/settings I need/want I should be back in business. I’m also getting back in business with the knitting and I’ve finally started working a bit more regularly on my two big projects, Aeolian and Rock Island. The only problem is that Aeolian takes about an hour a row right now, so it’s slooooow going! The light at the end of the tunnel is there, though. Soon! I’ve been knitting, really I have, but it’s just not happening that quickly. Everything seems to be a bit in the “blob” stage. 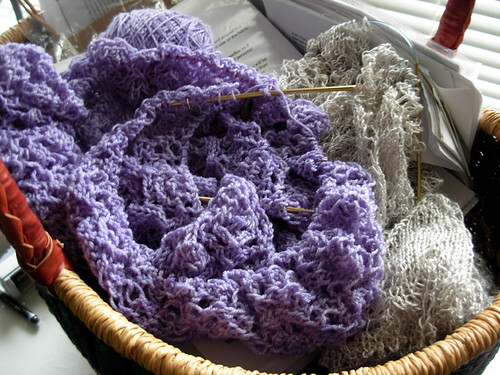 I do like the way the purple and silver complement each other in the knitting basket, however. One slightly more productive venture I’ve been on lately is bread baking. I’ve always enjoyed baking bread. A year or two ago I started baking bread for breakfast. 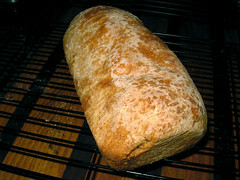 It got less fun—the feeling of obligation, that I had to bake bread now if I wanted it for breakfast. That is, it was less fun until I received a copy of Healthy Bread in Five Minutes a Day. I won’t say that it’s actually all that much faster in total to make the breads in this book (the recipe I was using before mixed up pretty fast, didn’t require kneading and made multiple loaves), but the ability to spread out the mixing from the baking over multiple days tricks my mind into thinking it’s less of a chore. Then of course, there’s the variety. Almost all (maybe all, I haven’t read every recipe) of the breads use whole wheat, but there’s so many variations: whole wheat loaf, rye bread, challah, strudel. And my personal favorite: cinnamon-raisin. Actually, I found that on the web site, here. It’s actually easier to make than I expected. 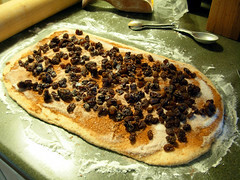 After the bread has been mixed up, allowed to rise and then chilled overnight (optional, but so much easier to work with), I roll out a piece to a nice rectangle and cover it with cinnamon, sugar, and raisins. Next, it gets all rolled up and set in a bread pan. 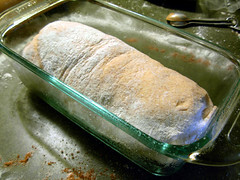 After a second rising, it gets baked and comes out in a nice cinnamony-raisiny loaf. Here I have to confess my inability to quite perfectly follow baking directions: there’s supposed to be an egg wash on top before it bakes (to give a nice crust). I don’t bother. Regardless, it’s quite yummy toasted with a little bit of butter. It’s always nice to have a little homemade start to the day!